The wood lily (Lilium philadelphicum) is one of the more attractive prairie plants, but hard to raise. Starting with a seed, the first year one gets only a single tiny leaf which dies back in the fall. The next year one may get another leaf, or perhaps two, both small and inconspicuous. If you aren't careful, you can toss them out. A few more years of this may ensue and you may start to wonder. However, what is happening is that the plant is building a bulb, which will eventually make a real plant. 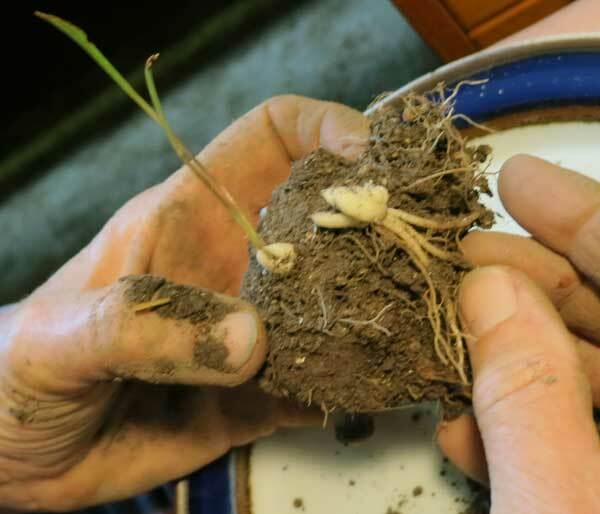 The photo here shows two fairly substantial bulbs that were eventually made from two seeds. These plants were in a flat outdoors for 4 or 5 years with nothing but an occasional watering. Now these bulbs are probably ready to get a permanent location in a prairie. The root system is pretty substantial. These are the sorts of plant that the seed companies sell as bare root. Yesterday, the hottest day of the year (97 F! ), the crew worked (until noon) at Black Earth Rettenmund Prairie finishing up the first major sweet clover work of the year. Fortunately, we had some important help from a group of Edgewood College students. For the past few years Nicole Kime of the Department of Natural Sciences at Edgewood College has been bringing groups of students for a work day. Sometimes it is fall and they collect seeds, but this time they were summer students who helped us deal with sweet clover. Ever since Black Earth Rettenmund Prairie was purchased by the Nature Conservancy in 1986 sweet clover has been a problem. In the early years it was so bad that it had to be mowed, but the last time it has been mowed since Kathie and I have been managing the site was 2008. 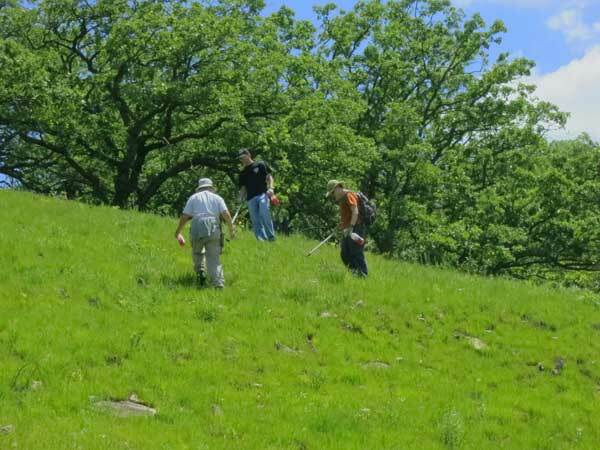 Now we control it by hand pulling, which is time consuming but lots more benign, leaving the native vegetation unaffected. The photo (taken by Kathie) shows Nicole and her students together with Amanda and our three interns. 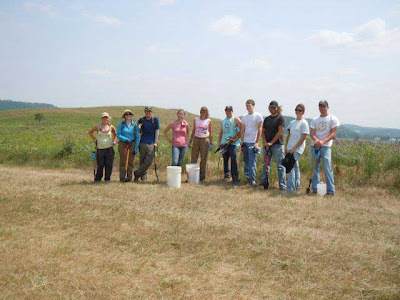 With a group this large, we were able to make short shrift of a large sweet clover area! We should have a few weeks off from sweet clover now, but will be back again from mid-August until the fall to get the late bloomers. We are determined to keep any sweet clover seeds from maturing. Despite the intense heat and drought, compass plant (Silphium laciniatum) is thriving all over Pleasant Valley Conservancy. Since this species is famous for its long root system (as deep as 12 feet, so they say), it is perhaps not surprising that the drought hasn't affected it yet. 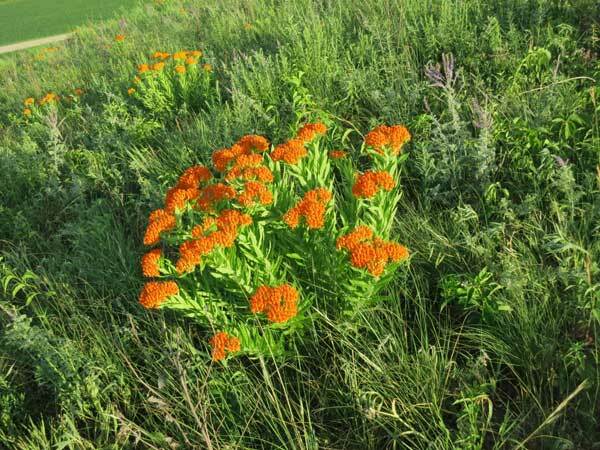 Since this is an icon of the tallgrass prairie (with a C value of 8), it is nice to see it doing so well. In addition to our planted prairies, we now have it flowering in open parts of several of our savannas, and even the south-facing slope, although very dry, has several plants in flower. According to Cochrane and Iltis, this species is a distinctive tallgrass prairie "indicator". Indeed, it is part of the logo of The Prairie Enthusiasts. Although it normally blooms in July and August, this year, with our unusual climate, it started blooming in mid June. 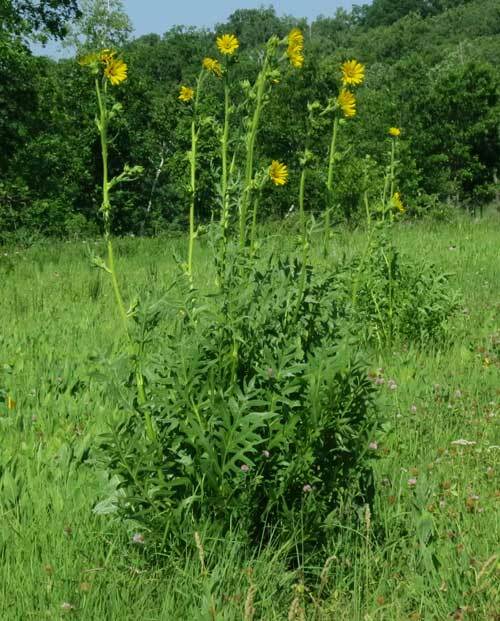 Compass plant is always the first of the four Silphium species to bloom. Prairie dock is just starting to send up flower stalks, and cup plant and rosin weed are still primarily in the vegetative phase. This is peak season for birds foot trefoil (Lotus corniculatus), a pesky ag weed that won't seem to go away. In contrast to many of the other ag weeds, this is a perennial, with a growth habit that makes it difficult to eradicate. For years we tried to eradicate it by pulling. Although pulling works for a biennial such as sweet clover, it doesn't work for a perennial, since you can never get all the underground viable fragments. After about 10 years trying various approaches, I think we have finally worked out a procedure that works. 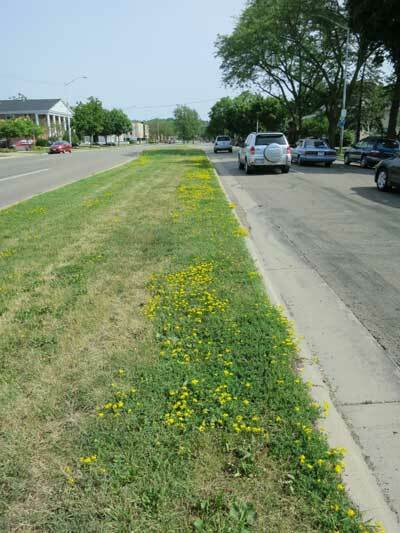 If you drive any road in Madison right now, you are seeing birds foot trefoil. This is a plant that "likes to be mowed", and actually benefits by roadside or median strip mowing. What mowing does is cut down the plants that might cast shade on birds foot. 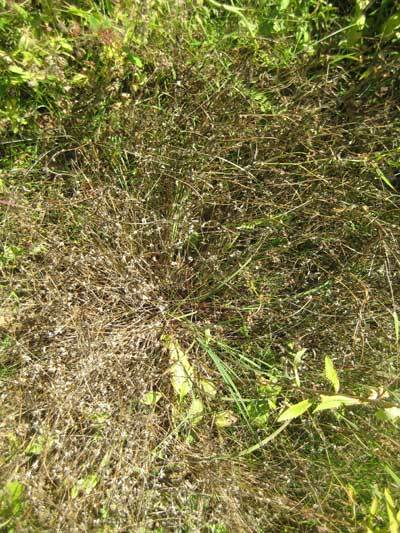 Because of its low growth habit, birds foot is not affected. 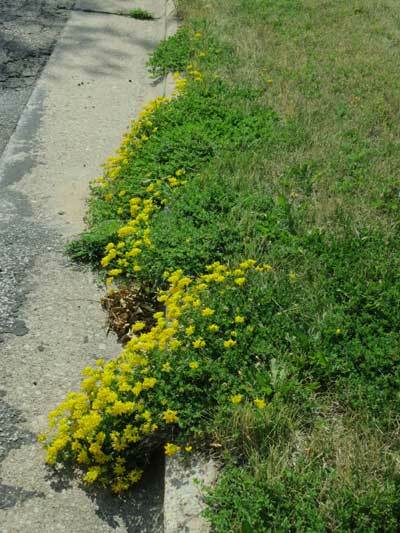 Note that birds foot has never been planted in these median strips. 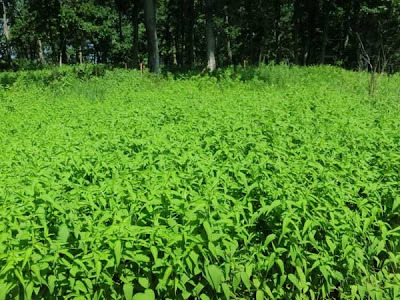 It is an escapee from ag fields, where it is sometimes planted as a forage crop for pasture, hay, or silage. It has become a serious invader in our area. Do not let its "pretty" color fool you. Nothing that is this difficult to eradicate is pretty. At Pleasant Valley Conservancy birds foot is found primarily in our planted prairies, especially Pocket, Ridge, and Toby's. Not surprisingly, we also see it occasionally in the middle of our service road. Until it flowers it is almost impossible to spot from a distance, but once it flowers it can be easily seen. The patch in the photo below is from the Pocket Prairie, one of our "prime" problem sites. I spotted this easily from about 100 feet away. We are fairly certain that birds foot moved in from the adjacent farm, where it had once been used for sheep. In our early days, we were ignorant of the biology of this species, and the printed information about control was sketchy. Several web sites recommend mowing to a height of less than 2 inches for several years, which seems foolish, since this would also effectively suppress all native species. 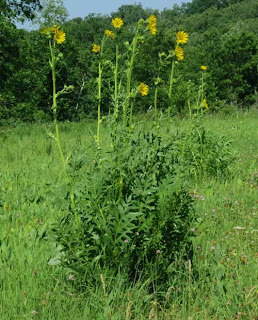 As we discovered by digging, a single plant (such as the one shown in the Pocket Prairie photo) has a deep tap root from which a large number of separate stems grow, crawling out over the ground. If you grab each of these flowering stems and lift it up, you will discover that they all arise from the single tap root in the middle. This gave me the idea for how to control it. With birds foot trefoil, the technique is to grab some of the individual stems and lift them so that the center of the colony can be found. A few spritzes in the center is all that it takes to eliminate the whole plant. 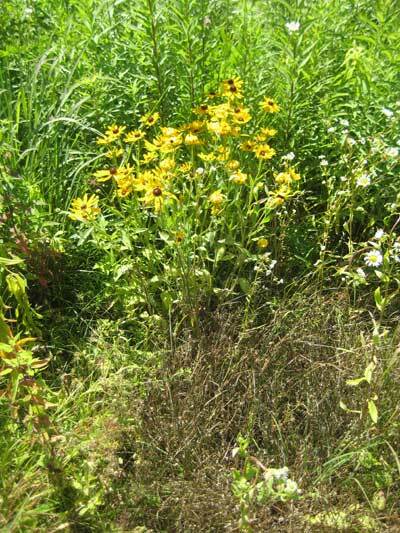 The photo to the left shows a dead birds foot plant adjacent to a thriving colony of black-eyed Susan. The larger photo below shows how the various individual "shoots" thread their ways back to the tap root. Treated plants do not recover either the same or subsequent year and thus are eradicated. This technique also works for small plants that are just getting started, although one must be careful not to "overspritz." Our approach is to wait until flowering time and then canvas the whole area of a problem prairie. Because no digging or mowing are involved, it takes little time to deal with a single colony. I did 8 separate colonies in the Pocket Prairie in less than 15 minutes. Butterfly milkweed (Asclepias tuberosa) is probably the most "showy" of the milkweeds, and is a species that invariably attracts attention in prairies and open savannas. Probably because of the early spring and unusual summer weather, this is a fantastic butterfly milkweed year. Flower color here derives from two chemicals, carotenoid, which is yellow, and anthocyanin, which is red. The carotenoid concentration remains relatively constant whereas the anthocyanin color is superimposed on this and varies considerably. In yellow plants the anthocyanin is low or absent and as anthocyanin is added the color gets progressively redder. On a motor trip from Kansas to coastal Virginia, Woodson collected more than 50 separate populations and found striking geographical variations. Minnesota, Oklahoma, and Kansas, for instance, had colonies which were all yellow, whereas in Missouri, Illinois, and Iowa orange-red predominated. Although most of the butterflyweed at Black Earth Rettenmund is rich orange red, there are distinct color variations. Also, Kathie has found a pure yellow population in a planted prairie at Pleasant Valley Conservancy. It is well known that dormant buds of trees are relatively heat resistant. It appears that the cambium, which supplies water to the leaves, may be more fire sensitive and was heat girdled by the burn. So the buds opened and formed normal leaves, but as they expanded their demand for water could not be met. With the advent of summer heat, the leaves (and the tree) died. This isn't the first time I've seen trees being affected by heat girdling. About ten years ago we had a few smallish red maples on the north side of Toby's Prairie. They appeared to survive a spring burn fine but in midsummer the leaves turned red and dropped and the trees died. Here is a more complicated phenomenon involving heat girdling: smallish white oaks in our savanna appeared to survive a hot fire reasonably well. The leaves came out in early May normally but a few weeks later the lower leaves turned brown and died. The upper leaves remained fine. Interpretation: the fire was hot enough to heat girdle the lower leaves but the upper leaves were far enough away from the heat to be unaffected. I've seen this latter phenomenon twice, in different years, in two separate savannas. How much heat can a vital part of a tree stand? According to U.S. Forest Service literature, the lethal temperature is about 60 C (140 F). But it looks like dormant buds may be able to withstand higher temperatures than the small twigs that supply them with water and minerals. 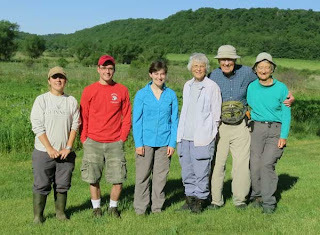 Yesterday the Southern Wisconsin Butterfly Association (SWBA; a chapter of the North American Butterfly Association) led a field trip to Pleasant Valley Conservancy. 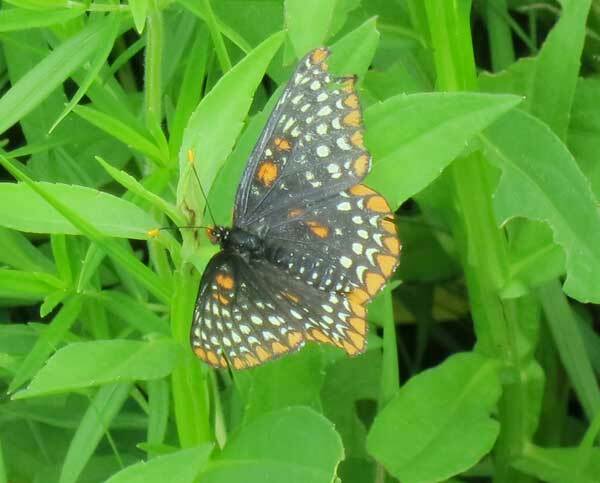 The weather and the butterflies cooperated and it was a great trip.The leader was butterfly photographer Ann Thering. Also present were Dorothy and Karl Legler, butterfly experts and stalwarts of the Wisconsin group. 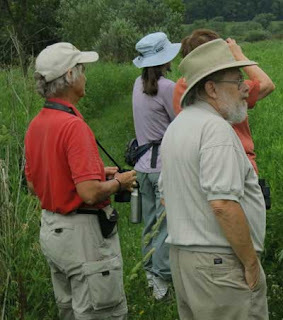 The trip focused on butterflies of our wetlands and wet mesic prairies. Most of the time was spent along the fire break between the Valley Prairie and the marsh. The original plan had been to cover a lot more ground, but there were so many butterflies in this area that there was no need to go further. The trip probably benefited greatly from the great burns we had had in early March. Because of the favorable early spring weather, we were able to burn both the Valley Prairie and the marsh on March 13. One of the favorites was the Baltimore checkerspot, a not common species but one that was especially prolific yesterday. The caterpillars of this species feed almost exclusively on turtlehead (Chelone glabra), a wetland species that seems to benefit from prescribed burns. 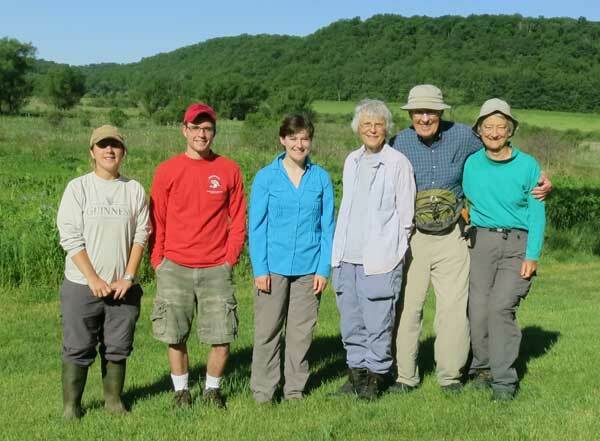 This is the third year that SWBA has led a trip to Pleasant Valley Conservancy. We are pleased to host these trips and are grateful for all the information on butterflies that they give us. It can be mowed but timing is critical. It has to be in flower so that the mowed stump won't resprout, but if mowing is delayed too long seed set may have already occurred. Hand pulling is the method of choice, but this is laborous and time-consuming, and generally comes at the hottest time of the summer. Pulled plants that have already flowered may go on to make seed and hence must be bagged, an awkward procedure. A good rain makes hand pulling lots easier, but if the plants are already flowering you can't wait for rain. We seem to be in a drought right now and who knows when it will really rain? Small plants can be hand pulled now (with difficulty) but for large plants, especially multi-stemmed ones, a shovel must be used. The ideal shovel is a Parsnip Predator, sold by the Prairie Enthusiasts. The photos here are of a home-made version. The shape of the blade is critical. The goal is to cut the root of the sweet clover plant far enough below ground so that the plant will not resprout. Once the plant is cut, the whole plant is removed (and bagged if there is danger of seed maturation). 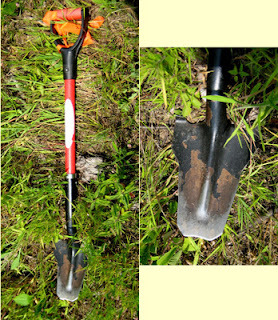 With the narrow profile of this shovel you can get the tip below ground where it will cut the root. At the same time, nearby native plants are not disturbed. Also, the wide top part of the shovel is needed for the foot. Although we have sweet clover at Pleasant Valley Conservancy, it is minor in comparison to that of Black Earth Rettenmund Prairie. Therefore, our regular crew plus interns have been working there at least two days a week. Lots of stoop labor! 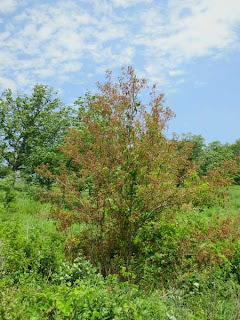 Once the major infestations have been dealt with, we will continue doing sweet clover at BE until early fall, since scattered plants keep coming up all summer, and there is also fall regrowth. Although these late-arriving plants are small (and hence difficult to find), they generally flower and make at least a few seeds. Our goal is to keep any new seed formation from occurring. Today I spotted a small patch of violet-flowered plants on the lower part of our south-facing slope. We soon ID'd it as crown vetch, a ghastly invasive plant that we have never had at Pleasant Valley Conservancy. By noon we had destroyed it with Garlon 4. We'll be monitoring the site for any residual growth, and will be keeping an eye out for any new patches. I've seen what crown vetch can do to other prairie remnants in our area. We won't let this happen here! How did it get here? We'll probably never know. This seems to be a good year for purple milkweeds (Asclepias purpurascens) and right now they are at their peak. This is an excellent time to search for new populations, as the flowers really stand out among all the lush greenery. Purple milkweed is best found in savannas, open oak woodlands, or (rarely) along roadsides. It is endangered in Wisconsin and is not really common anywhere in its range (eastern North America). Fortunately, we had a few native populations at Pleasant Valley Conservancy that had survived years of neglect and they have expanded greatly as a result of our savanna management. In 1998 we started with two sites and through continued management as well as transplanting from greenhouse-raised plants we now have 28 separate populations. About half of these populations appeared spontaneously, and the rest arose from transplants. The number of separate stems and flower umbels at a site varies from year to year. This year most of the populations are very flush, possibly due to the early spring. The photo below shows one of the better populations in a white oak/Hill's oak savanna. Early June is when I always make my purple milkweed survey, checking all existing sites (permanently marked) as well as looking for new sites. Our crew is encouraged to report new sightings and Amanda has already found one. 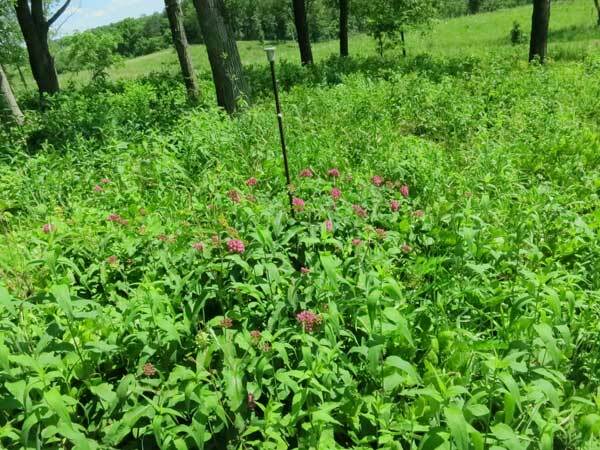 I published a paper on my purple milkweed work in Ecological Restoration in 2009 and an illustrated version of this paper can be downloaded from this link. One of the problems that has arisen this year is the invasion of some of our purple milkweed populations by woodland sunflower (Helianthus divaricatus). If you have been following these blogs for a few years you know that we have been battling this plant off and on throughout most of our savanna areas.The photo below is not atypical of what can happen if this plant is not controlled. The stem density of these sunflower clones is very high, and absolutely nothing is able to grow with them. The approach we are using is to kill the scattered plants that are moving in with a careful leaf spritz of Garlon 4 in oil whereas giant clones such as this one are being sprayed with glyphosate and the whole area reseeded with native vegetation. Monoculture of woodland sunflower (Helianthus divaricatus) at the edge of a white oak savanna. We have now moved into summer brush and weed control mode. During the period after our spring burns we controlled brush by foliar spraying with Garlon 3A aqueous the small resprouts that arose from fire-killed woody vegetation. This had great advantages, because the resprouts were small and hence required small amounts of herbicide. Also, they were easy to find because the native vegetation in the prairies and savannas was small so that the plants to be sprayed really stood out. Also, spacing between native species was wide so that spraying of resprouts could be accomplished without endangering "good" plants. 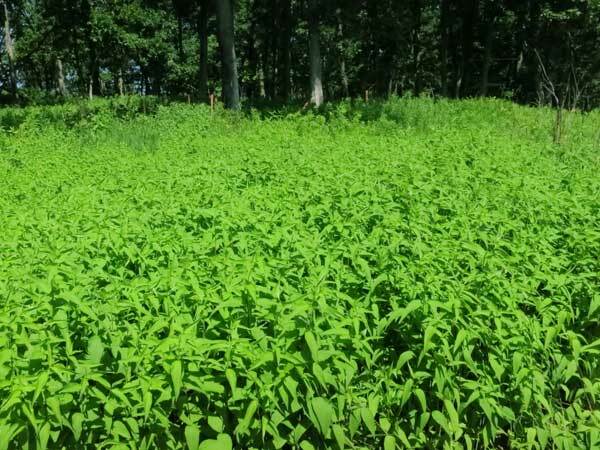 However, during the last two weeks of May, the native vegetation (as well as the target species) showed amazing growth spurts, and now it is no longer possible to use a foliar aqueous herbicide. We have switched to an oil-soluble herbicide (Garlon 4 Ultra in bark oil NT) used at a much higher concentration (20%). 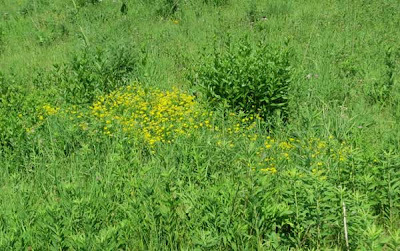 With this mixture, only small volumes of herbicide are required, which can be carefully applied to the target species. 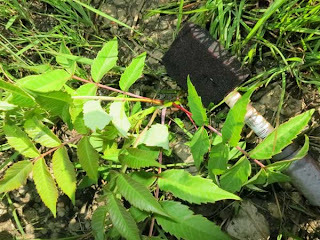 For woody plants such as sumac and buckthorn, a basal bark technique is used, with the herbicide applied with a paint sponge. For herbaceous plants such as sunflower, Canada goldenrod, and pale Indian plantain, the leaf spritz technique is used. A small amount of herbicide is deposited with a spray bottle on one or two upper leaves. No herbicide reaches the ground, or touches any of the "good" plants nearby. The herbaceous plant usually shows a response within an hour or so and by the next day has wilted. A few days later it is dead. Small sumac being basal barked with Garlon 4 in oil using the paint stick technique. The sponge technique is ideal for sumac. All that is required is a gentle swipe along the lower stem with a sponge saturated with herbicide. Within three or four days, the leaves start to turn red and within a week or so are brown. Kathie and our two summer interns working on the south-facing slope, using the sponge stick technique. While working in an open savanna area I flushed a brown thrasher off its nest. 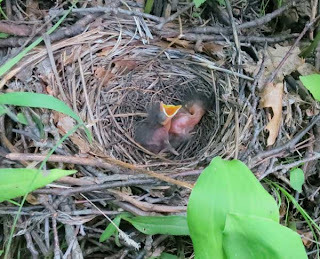 I followed the line of flight back to the ground and found, among a small patch of false solomon's seal, a nest with two babies. With their mouths wide open, these babies were obviously hungry, so I quickly left the area so that the parent could return. Brown thrashers are fairly common in our restored savannas, and I have flushed them before. One of the "joys" of controlling buckthorn and other invasive shrubs is that it gets you into areas where these birds nest. Although not endangered, current Breeding Bird Survey data indicate persistent declines statewide. According to the Wisconsin Bird Conservation Initiative, this species benefits from areas that are burned annually, since that keeps the shrub component small. Since our management plan calls for annual burns we are obviously doing right for this species. We have just added two full-time interns to our work crew and we are off and running for the summer. We will be working at least one day a week at Black Earth Rettenmund Prairie and the rest of the time at Pleasant Valley Conservancy. From time to time we will be joining Rich Henderson's crew at Mounds View Grassland for some shared work. As we move into summer mode, our work on brush control is tapering off and our work on herbaceous weed control will be taking over. We will also be doing monitoring of the sites as well as occasional collecting of seeds of species that mature early, such as golden Alexanders, shooting star, spiderwort, and lupine. We are delighted to have our two summer interns (Dan and Sarah) join us!